Toronto Dogs Directory: Dogs Aren't Just Christmas Presents...DOGS ARE FOR LIFE! Dogs Aren't Just Christmas Presents...DOGS ARE FOR LIFE! At this time every year kids are writing their letters to Santa and at the top of many of those lists? If you are thinking of adding a four legged family member around the holidays, be it a puppy or adult dog, please remember what a serious decision you are making and remember, there's no rush. There is certainly no reason a new dog should be an "impulse buy"! - The holiday season is one of the craziest times of the year (in case you didn't know!). People come and go and the house is a flurry of activity. Remember that new doggies need routine and it's best to introduce them to their new home when things are calm and relaxed. It's not very easy to provide that for them amid all the holiday chaos. - The holidays can represent many safety issues for puppies and older dogs alike. Electrical cords are ripe for chewing, the house is usually far from, "puppy-proofed", and the food we love to eat during the holidays can be extremely dangerous or even fatal to a dog. Every year in January rescues and humane societies report a surge in dog returns. The reasons range from, "We didn't know he'd be so active!" all the way to, "The kids lost interest after a couple weeks." Forget the impact returning a pet has on a family or on the rescue or shelter, consider the impact on the dog itself. Imagine spending your days cramped into a small cage to then be rescued. The next few weeks are the best you've ever known. You are surrounded with love, cuddles, and more joy then you thought you'd ever see. It's short lived though, as soon after you are put right back in that very same cage you thought you'd escaped forever, through no fault of your own. creator of, "For Better or for Worse"
There is no rush to add a dog to your family, and there is no rule that says December 25 is the best date on the calendar to do so. If you are serious about getting a dog for Christmas and wan't it to be a surprise (that is the point of an awesome gift, after all! ), might I make a suggestion? Wrap up an adorable plush puppy to place under the tree. 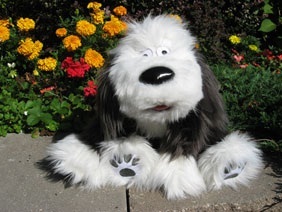 Pictured here is the, "Plush Farley". He's $20.00 and all proceeds go toward the Farley Foundation, a tremendous organization that has, since 2002, assisted over 6 400 low-income pet owners by subsidizing non-elective veterinary care of their sick or injured pets. See? I just gave you a list of things to talk about at Christmas dinner! Two weeks later, when the tree is gone and the Christmas lights come down, the kids will be just as excited about adding a new family member. They will have understood the importance of making and preparing for one of the biggest decisions of their young lives. Best of all? They will have learned the relationship with their new best friend is equally as important each and every day of the year.